This stand-alone holiday home with private swimming pool is situated on the western coast of Istria, in the village of Kaštelir. The well-known city of Poreč is just 13 km away. It is the perfect place for admiring the historic centre or taking a refreshing dip in the Adriatic Sea. You can find the closest beach at Lanterna (10 km), and for a day on the water, the water parks of Istralandia and Aquacolors are 20 minutes by car. Don't forget to pay a visit to the artistic village of Motovun with narrow streets and great restaurants (24 km). 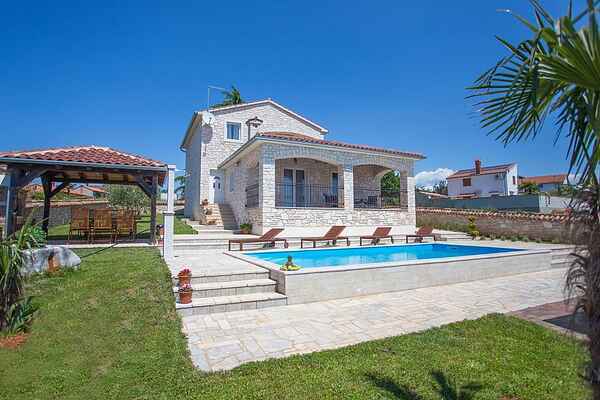 Villa Gordana features an enclosed garden with BBQ and two covered terraces with a dining table so that you can enjoy a meal whether you're indoors or outdoors. You can enjoy the sunny Istrian summers by the swimming pool with sun terrace and sunloungers. The villa is tastefully decorated and comes with air conditioning. The ground floor features an open kitchen, a living room with access to the terrace, a dining area, open fireplace, bedroom and a bathroom. There are two further bedrooms and bathrooms on the first floor (including a bathroom and suite with jacuzzi) and a terrace.